Not doing it will be catastrophic. We'll be eight degrees hotter in ten, not ten but 30 or 40 years and basically none of the crops will grow. Most of the people will have died and the rest of us will be cannibals. I think that they're patriots and that they don't like us because we've invaded their country and occupied it. I think if the Iraqis were in Washington, D.C., we'd be doing the same thing: we'd be bombing them too. Nobody wants to be invaded. 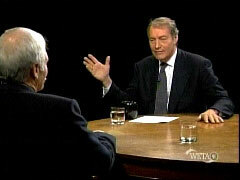 At some point Wednesday, video of the interview should be added to this page on the Charlie Rose Web site. In a Tuesday Today segment with Lynne Cheney about her children's book on George Washington crossing the Delaware River, Matt Lauer referred to how Washington led "a rag-tag group, not well-fed, not well-clothed, completely under-equipped as compared to this great British army," and pivoted to Iraq: "Let me ask you to think about what is going on in Iraq today where the insurgents not well equipped, smaller in numbers, the greatest army in the world is their opposition. What's, what's the lesson?" Lauer argued that "the insurgents believe they're fighting for a cause as well. They don't believe any less than we believe." Cheney scolded him: "You're being awfully relativistic here. I mean, the insurgents are killing Iraqis by the hundreds, Iraqis by the thousands. It's not as though this is a matter between just 'on the one hand on the other hand.' We are on the side of freedom." Streaming Real of that exchange. Or, downloadable Real video (775 KB), downloadable MP3 audio (175 KB). CHARLIE ROSE: So what's wrong with the population? TURNER: We're too many people. That's why we have global warming. We have global warming because too many people are using too much stuff. If there were less people, they'd be using less stuff. 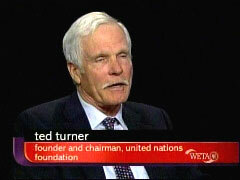 TED TURNER: I also said war doesn't make any sense anymore. And we need to cut the military budgets back. TURNER: Right now the U.S. is spending $500 billion a year on the military which is more than all 190 countries in the world put together. The two countries that the military-industrial complex and some of the politicians would like to demonize and make enemies are Russia and China. China just wants to sell us shoes. They're not building landing craft to attack the United States. And Russia wants to be our friends, too. ROSE: You're telling me the Chinese military budget is not increasing? Is that what you're saying? TURNER: It might increase, but you know how big it is compared to ours? It's one 20th what ours is and so is the Russian military budget. Those are not credible expenditures. However, even with our $500 billion military budget, we can't win in Iraq. We're being beaten by insurgents who don't even have any tanks, they don't have a headquarters, they don't have a Pentagon. We don't even know if they have any Generals. ROSE: They have a lot of roadside bombs that kill a lot of Americans. TURNER: Well, that's right. That's exactly right. ROSE: And where do you think they come from? TURNER: I think that they're patriots and that they don't like us because we've invaded their country and occupied it. I think if the Iraqis were in Washington, D.C., we'd be doing the same thing: we'd be bombing them too. Nobody wants to be invaded. ROSE: Nobody likes an occupying force, or to be occupied. TURNER: That's right. It's gotten to be -- it's passe. You know, it's time to move on. I mean, all we have to do is look at Vietnam. In Vietnam, we killed three million Vietnamese. They never attacked us, we attacked them. It was another one of these preemptive wars like the war in Iraq. And we lost 50,000. They lost three million. That's like 60 for one. But at the end of 18 years we left and the Vietnamese were there. I'm just so glad, because I think about it a lot, that the Vietnamese, the North Vietnamese, didn't give us an ultimatum that we couldn't leave Vietnam until we signed a decoration of surrender, you know, so they could get that on tape just like the Japanese surrendered on the Missouri. ROSE: We made them sign a declaration of surrender. TURNER: Yeah, but we surrendered and then we could go home. We couldn't go home. What if the Iraqis, the insurgents say that: we're not going to let you leave until you sign a surrender document, we just want the mighty United States. I mean, that's how ridiculous the whole situation is. ROSE: But where does this, where did this idea come from? TURNER: I think a lot. I spend a lot of time thinking. And I hope that's not a sin. And let me tell you another one, another story: We're not the only superpower that's being beaten by a third world country that doesn't have a single airplane. The Russians got beat, too. TURNER: Well, we were helping Osma bin Laden, we were backing him that time. — Exchange on CNN’s The Situation Room, September 19, 2005.